Square Enix is back at it again with the popular GO series. 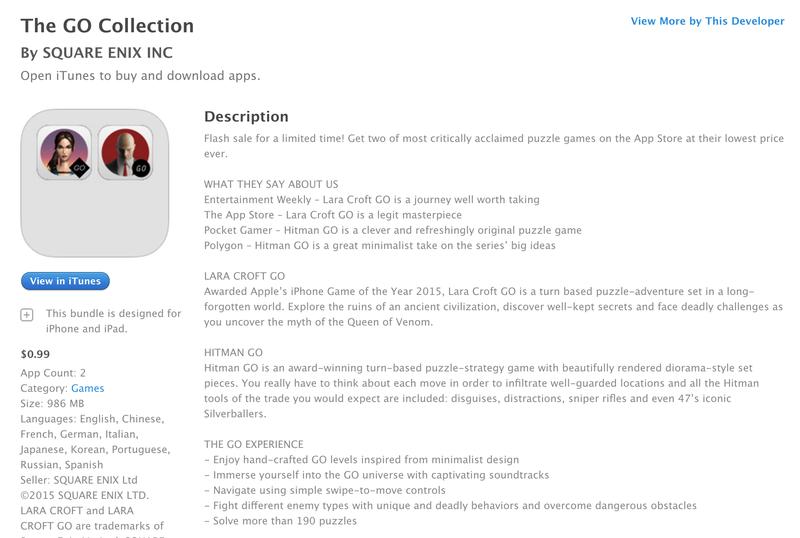 The GO Collection iOS bundle, that contains both Lara Croft Go and Hitman Go, is now on sale for $1. Both titles are also now being listed a $1 each individually as well. Both titles are usually listed at around $5 each, so the Collection bundle ($0.50 each) is about as low as it gets for these two highly rated iOS games. We still have some all-time lows on the Grand Theft Auto games for iOS and here’s is the latest Free App of the Week. LARA CROFT GO Awarded Apple’s iPhone Game of the Year 2015, Lara Croft GO is a turn based puzzle-adventure set in a long-forgotten world. Explore the ruins of an ancient civilization, discover well-kept secrets and face deadly challenges as you uncover the myth of the Queen of Venom. HITMAN GO Hitman GO is an award-winning turn-based puzzle-strategy game with beautifully rendered diorama-style set pieces. You really have to think about each move in order to infiltrate well-guarded locations and all the Hitman tools of the trade you would expect are included: disguises, distractions, sniper rifles and even 47’s iconic Silverballers.